Notes: Milnrow station was located on the 6 mile 54 chain Oldham Mumps to Rochdale line which was authorised in an Act of 1859 and built by the Lancashire & Yorkshire Railway (LYR). The Oldham Mumps to Rochdale line opened to goods traffic on 12th August 1863 and to passengers on 2nd November 1863.
located on the Rochdale platform A footbridge located at the north end of the station linked the two platforms. The goods yard was sited south of the station on the up side and comprised three sidings and two loops, one of which passed through a large brick goods shed. There was also a five ton crane. A signal box for controlling access to the yard was sited on the down side of the line some distance south of the station. At its opening Milnrow was served by twenty-four trains in each direction between Rochdale and either Manchester Victoria or, in some cases, Middleton, where connections to Manchester Victoria could be made. With the opening of the new line a route had been created from Thorpes Bridge to Rochdale, via Milnrow that became known as the ‘Oldham Loop Line’. Trains serving Milnrow continued to run between Manchester Victoria and Rochdale, but most of them now travelled via the newly-opened line; a few services continued to run via Middleton. On 1st January 1922 Milnrow station became part of the London & North Western Railway (LNWR) when that company took over the LYR. However on 1st January 1923 the LNWR was in turn absorbed into the London Midland and Scottish Railway (LMS). 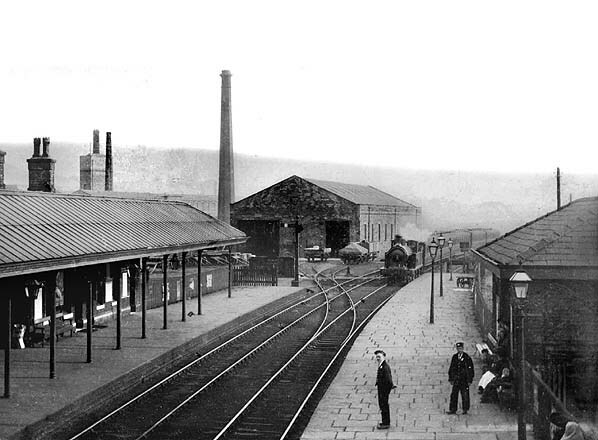 By 1938 Milnrow station was being served by fifteen local trains in each direction. On the 1st January 1948 Milnrow became part of the nationalised British Railways (London Midland Region). During the last year of fully steam operated services in 1958 there were eighteen trains in each direction running between Manchester and Rochdale using the Thorpes Bridge route and three Saturdays excepted trains called that had originated from Middleton Junction and travelled onward to Rochdale. In June 1958 British Railways introduced Diesel Multiple Units (DMUs) onto the Oldham Loop. A Cravens built type of DMU (later known as class 104) which had twin power cars was used on the line as they were easily able to cope with the steep gradients. The service pattern at Milnrow was a train every 40 minutes in each direction. The Reshaping of British Railways (Beeching Report) of March 1963 recommended the closure of the Royton branch to passengers but made no reference to the Oldham Loop or any of its stations. Nevertheless, September 1964 saw a decline in services calling at Milnrow. The trains between Manchester and Rochdale became irregular, serving Milnrow about every 45 minutes in each direction. The goods service had been withdrawn on 1st June 1964. From April 1966 further changes took place. The service pattern was altered so that most trains ran between Manchester Victoria and Oldham Mumps with only a few continuing onward to Rochdale. By 1968 Milnrow had only an hourly service in each direction. From 8th September 1969 the station was unstaffed, rendering some of the buildings redundant. By April 1974 they were demolished and simple masonry shelters had been constructed. Gas lamps still lit the station at that time, but electric lighting was soon to be installed. network’. 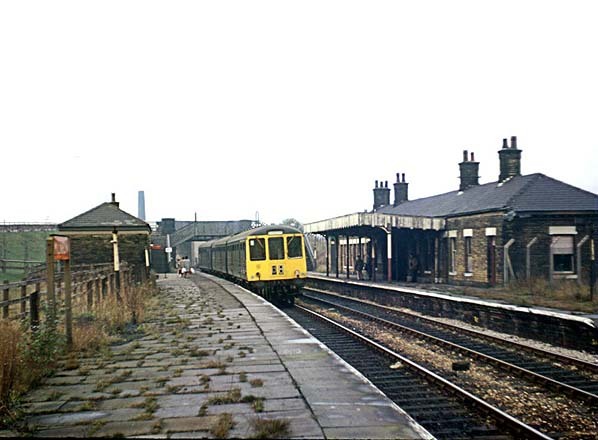 Subsequently a footnote in the May 1972 passenger timetable advised that the Secretary of State had given consent to the withdrawal of passenger services between Oldham Mumps and Rochdale. However, by this date, the South East Lancashire North East Cheshire (SELNEC) Passenger Transport Executive (Greater Manchester Passenger Transport Executive – GMPTE - from April 1974) had stepped in and agreed to fund the continuation of the service.. 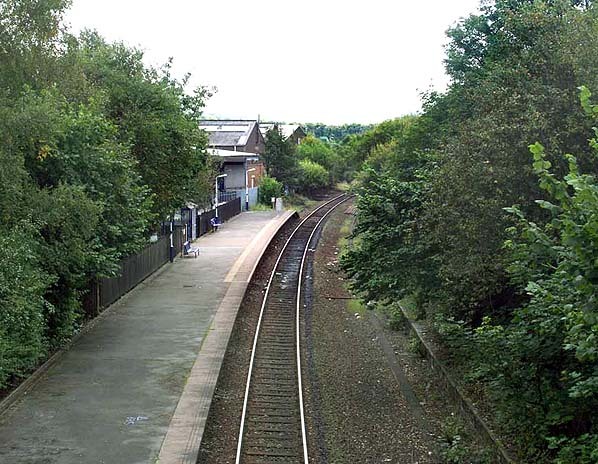 In 1980 the Oldham Loop was singled from Shaw & Crompton to Rochdale, and the former Rochdale direction platform at Milnrow was taken out of use: the former Manchester platform then served trains in both directions. 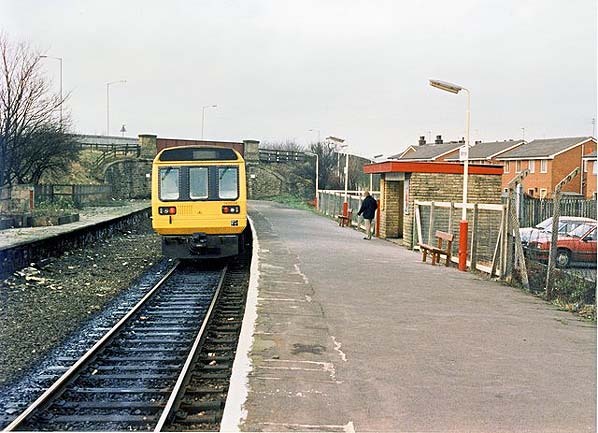 From May 1989 a half-hourly service to Manchester and to Rochdale was introduced at Milnrow, which encouraged more passengers to use the station. 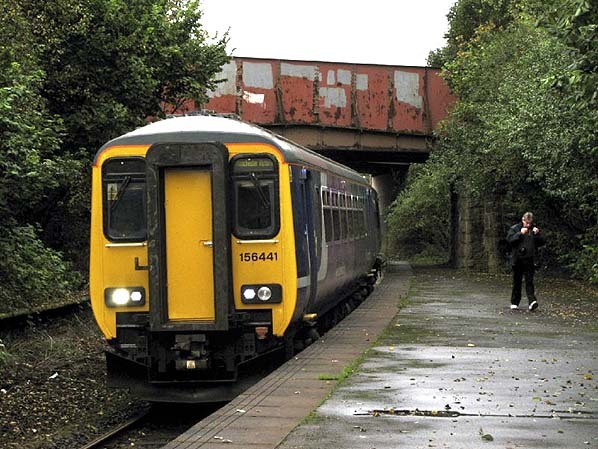 In May 1995 the last alteration was made to the train services at Milnrow. From this date the half-hourly service ran as an express service between Oldham Mumps and Manchester Victoria, thereby accelerating journey times. out the required works. To enable these works to go ahead the Oldham Loop had to close. Milnrow, along with all other stations on the line, closed on Saturday 3rd October 2009. A number of special services, including steam-hauled trains, ran on the last day to celebrate the line and its history. Many local people turned out to watch the last trains run. The final train to depart from Milnrow was the 23:25 Manchester Victoria to Rochdale service. Demolition of the station began almost immediately, and by May 2010 there was nothing left of it. To see film clips and pictures of the creation of the Metrolink tram route click here. throughout the UK at this time Milnrow is showing signs of neglect. It was however more or less still in its original form in 1972. 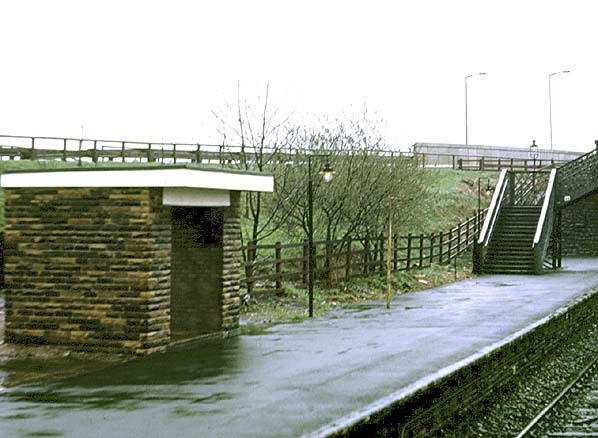 An April 1974 picture showing the down platform at Milnrow Station. Since 1972 efforts had been made to tidy the station up. Redundant buildings had been demolished and stone had been used to construct simple waiting shelters as seen in this picture. Interestingly the stations original lamps still survived at this date. Milnrow station looking south in 1989, by this date the line had been singled between Shaw and Rochdale leaving only the old up platform in use. Looking south east at Milnrow station from the road overbridge in September 2009. 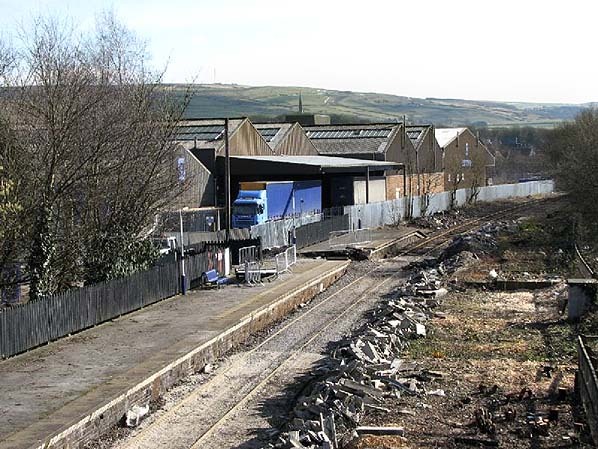 The derelict former Rochdale platform, out of use since 1980 can be seen to the right. A class 156 DMU arrives at Milnrow station on 3rd October 2009, the last day of public service. Milnrow station looking south east from Harbour Lane bridge in March 2010; the down platform has already been demolished. Looking south east at the Milnrow station site from the Harbour Lane bridge in April 2010. All trace of the station had been swept away. 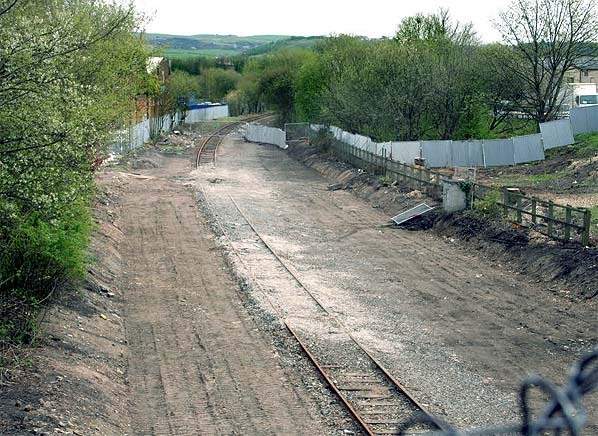 Looking south east at the Milnrow station site in late August 2010. The station had been completely demolished by this date and was being used as a contractors yard for track lifting operations. 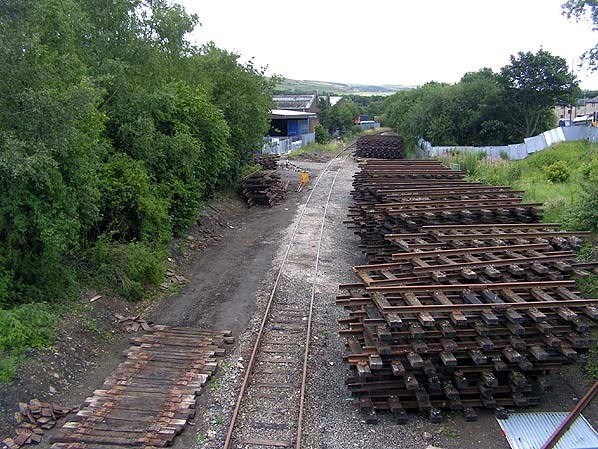 Sections of track from the Oldham Loop line can be seen cut up and stacked on the site of the former down line and platform. 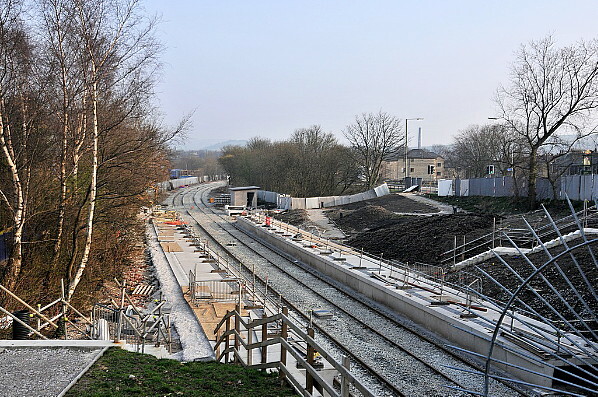 Looking south at the site of Milnrow station on 24 March 2012 during construction of a Metrolink tram line.